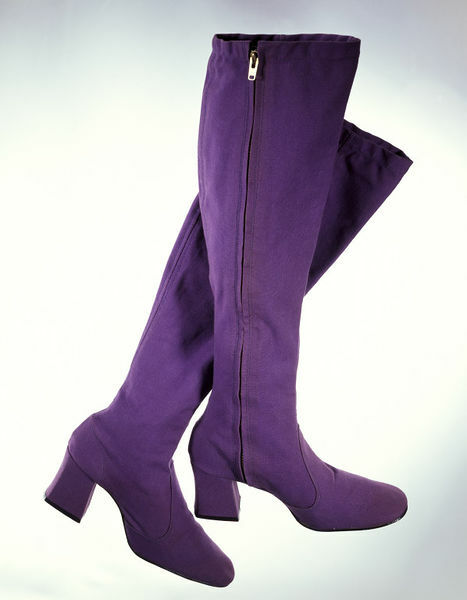 The Biba boot was an essential item for the young and fashionable in the 1960s and early 1970s. This purple canvas pair perfectly illustrates the key elements. High chunky heels, square toes, sturdy side zips, and a moody colour were all typical. The boots were produced in a wide variety of colours, and were also made in suede. They were notoriously skinny-fitting and were said to cut off circulation, but Biba devotees still wore them, buying up multiple pairs in different colours as wardrobe staples. Barbara Hulanicki and her husband John Fitz Simon set up Biba in 1963 as a mail order boutique. The success of their affordable, youthful designs enabled them to open a small shop in Abingdon Road in Kensington the following year. Many of London’s fashionable new boutiques catered only for well-off customers (Mary Quant’s Bazaar, for example), but Biba attracted glamorous pop stars, bohemian aristocrats and impoverished students alike. In April 1966, the American news magazine Time published a special edition celebrating ‘London: The Swinging City’. It named Biba as ‘the most in shop for gear’. 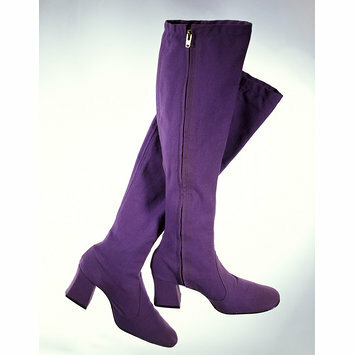 Pair of knee-high boots in dark purple canvas with side metal zippers. High, slightly flared heels and broad, squared off toes. The canvas is seamed and top stitched and the boot tops are darted to give a closer fit. The boots fasten at the side with a sturdy zip. The inner seams are reinforced. Historical significance: Pair of Biba's iconic, world-famous knee boots. These boots are one of the most potent symbols of Biba fashion. Pair of knee-high boots in dark purple canvas with side metal zippers, designed by Biba, London, 1969.